UPDATED 7/11/2017 WITH GAIA INTERVIEW ADDRESSING SKEPTICAL QUESTIONS – SEE BELOW. 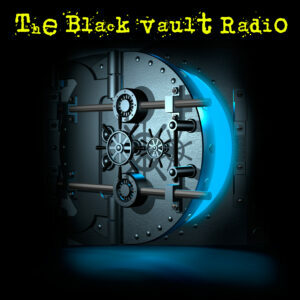 For those of you who follow The Black Vault, you will know I try to keep a logical, COMMON SENSE, approach to all things paranormal and conspiracy. My detailed critique of the “Roswell Slides” gave those curious, but critical, minds something to reference as the story unfolded. The story ultimately ended up being a misidentified artifact, or possibly, an outright hoax. You decide which one – but it was NOT alien. Now, only two years after that story broke, another “mummy” has appeared on the internet. This one, a three-fingered mummy, is being publicized by Gaia.com and investigative journalist Jaime Maussan, the same man who happens to be the one who publicized the “Roswell Slides” story above. Please note: Before I get into this critique, let me say I am a friend to the Gaia network. I have appeared multiple times on their shows, and am friends with many of those who are involved with the network. My critique is NOT against Gaia, but rather, against the specimen being investigated. I mean no offense to any of those connected to this project, and offer my critique for those that are interested. Also note that all images and corresponding photos are used for reference purposes, and the copyright is maintained by their respective owners. A new anomalous discovery has been unearthed in Peru. Join Gaia’s ongoing investigation and decide for yourself if this is proof of a non-human species. Within hours, it received hundreds of thousands of hits — and within 5 days — it was viewed more than 20 MILLION views on Facebook alone. Case in point: the world was watching and they were interested. But is this exactly what it is being portrayed? It is this representation which has many to believe, although Gaia is not saying “alien”, they are implying it with the graphic resembling that of a “grey alien” often depicted in alien abduction stories. In fairness again, “grey aliens” are humanoid in appearance given the many differing descriptions, so Gaia could not have ever escaped that critique by those who wanted to throw the implication. There are many issues with the Nazca Mummy which have many, including myself, asking a lot of questions. I found many different threads online talking about this story, many different websites touting it as proof of aliens, and even Snopes got into the action by labeling it a hoax — but to my disappointment — Snopes labeled it a hoax on their page, offering very little actual substance stating WHY it was a hoax. So, I created this page to offer a much more detailed critique of this story. This page will evolve as the story unfolds so check back often for updates. However, no evidence has ever definitively proved the existence of alien life, and countless “alien” discoveries have later been shown to be hoaxes or to have far more mundane explanations. That’s an unfair statement to make, since Snopes themselves acknowledge that Gaia only posed the question of an alien, but never labeled it as such. So, let’s take a look at the red flags (in my book) about this story, that will (hopefully) one day be addressed by Gaia, Jaime Maussan or by any of those involved in this research project. They are listed here in no particular order. The white plaster-like appearance of the Mummy is unlike others discovered from the same time frame and region. This is one of the biggest red flags, which is often cited by skeptics of this case. No one can help but see a similarity between a plaster made model, and this mummy. I began researching mummies found in the same region, from around the same time frame, and can not (at the time of writing this critique) find references that this embalming method was commonplace for the region. You can see the plaster-like material disintegrate on the small platform as the mummy is handled. (This either supports the substance is very much plaster-like and possibly not an indicator of a real mummy, OR it supports the lack of scientific method used with this artifact, see below for more information on that). You can see that whatever the “outer coating” is of the mummy, it is disintegrating while the mummy is being handled. For reference, I was able to find a shelf full of mummies from the Chachapoyas, which was in present day Peru. 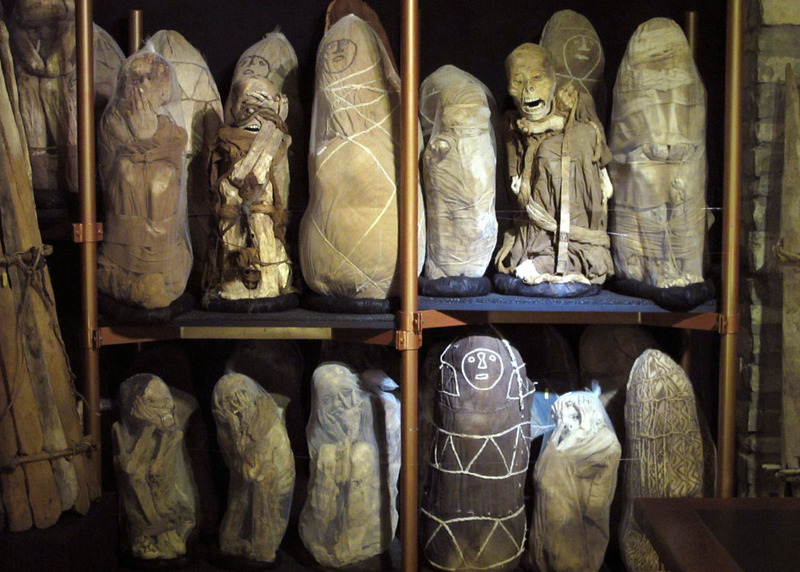 This photographs depicts many different mummies from the region. There are many examples to show, but I chose this one for the article. It was posted on Pinterest and is credited/copyrighted to Reuters/Mariana Bazo. The photo has nothing to do with the Nazca mummy discussed here and is simply used for reference purposes to show mummies from the same time and region. Although one mummy appears to be a similar, plaster-like appearance, I do believe that this is simply the lighting on the bottom right of the photo. Most (all?) are the normal tan appearance, while others were discovered wrapped. The lack of similar characteristics could be due to sub-cultural differences in embalming methods in the region, but again, I was unable to find any references to show similar looks/appearances of mummies around the same time. The elongated skull is nothing new, or even rare, for the region. 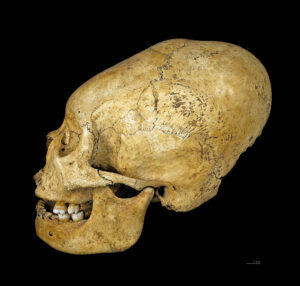 The elongated skull has added to the intrigue and the mystique of this find, but it is not rare for the region. So, let’s just pretend for a moment this is not a hoax, but a genuine find. The odds of it being “alien” and having similar characteristics to those cultures found in the region, at the same time, is pretty nil. New species? This doesn’t rule that possibility out – but may be more of a deformity as the explanation, or just a downright hoax. The choice of location to analyze the mummy and collect samples is questionable. As you can see, this is outside, and not in a laboratory setting. This frame of video shows the lack of proper equipment. The “table” the mummy sits on, is not much wider than the mummy itself. The dangers posed by this alone, puts the scientific method into question. In this frame of video, you can clearly see the lack of proper equipment. The “table” the mummy sits on, is not much wider than the mummy itself. The dangers posed by this alone, puts the scientific method into question. The lack of detailed information in any of the released material (as of the writing of this critique). There is a big question mark about a discovery, when the one making extraordinary claims can not tell you when, or where, the specimen was discovered. As of the writing of this critique, there has not been a single shred of any evidence, that this was discovered by a reputable (or even a questionable) archaeologist, scientist, historian, librarian, disc jockey, television producer or a paleontologist. The videos simply skip this information, and go directly into the discovery itself. To show this was or is a legitimate discovery, there should be more information given to the public about it’s origin. The main player involved. Sadly, we can not get away from the main “promoter” of this discovery, Jaime Maussan. I have met Jaime many times, and I believe him to be a very nice man, successful and very popular with his audience. But we can not get away from the controversies that have surrounded his many stories over the years. Here are just a select few HOAXES that were promoted by Jaime Maussan, then kind of brushed under the rug as newer stories appeared. 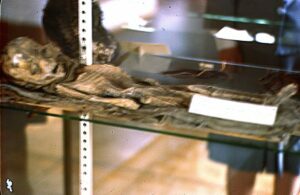 This “Alien” mummy as appearing in the “Roswell Slides” now considered a hoax. This fairy now considered a hoax. 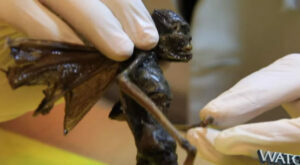 This little guy, known as the “Metepec creature” now considered a hoax. This “Alien” photo from 2005 now considered a hoax. 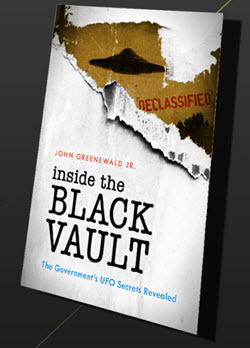 There has been a long line of these types of stories that garner worldwide attention, and even gain quite a bit of money from “pay per view” subscriptions, like the Roswell Slides story. But after the limelight, after the money rolls in, they turn out to be nothing more than a hoax. Since Jaime Maussan is clearly featured in this video — one has to consider this possibility for this story as well. The Team of Scientists is questionable. I am not one to say that just because a doctor researches fringe topics, they are not reputable. However, we do have to point out a few things about those featured as part of the research team that take away from the credibility of this story. Dr. Konstantin Korotkov – One of the main voices in the video, is Dr. Konstantin Korotkov. He speaks highly about the scientific importance of the Nazca Mummy, but researching his background, it is unclear why he would be one of the main voices (if a voice at all). All references to Dr. Korotkov, is about his research into Kirlian Photography. One reference to his work appears on the Wikipedia page for Kirlian photography:“Konstantin Korotkov developed a technique similar to Kirlian photography called “gas discharge visualization” (GDV). Korotkov’s GDV camera system consists of hardware and software to directly record, process and interpret GDV images with a computer. Korotkov’s web site promotes his device and research in a medical context. Izabela Ciesielska at the Institute of Architecture of Textiles in Poland used Korotkov’s GDV camera to evaluate the effects of human contact with various textiles on biological factors such as heart rate and blood pressure, as well as corona discharge images. The experiments captured corona discharge images of subjects fingertips while the subjects wore sleeves of various natural and synthetic materials on their forearms. 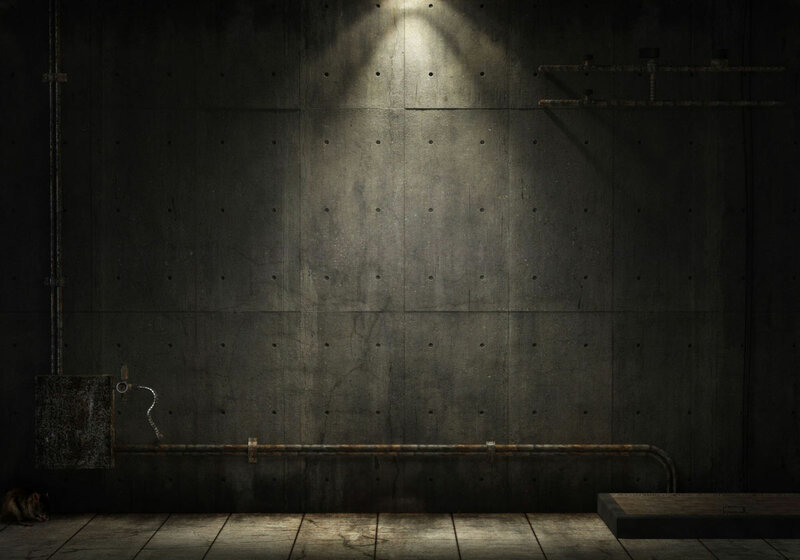 The results failed to establish a relationship between human contact with the textiles and the corona discharge images and were considered inconclusive.”His background, and realm of main research study, is almost the complete opposite of what he is being interviewed about. As a television producer, when we talk about archaeology in a documentary, we use an archaeologist. When I talk about astronomy, I use an astronomer. The use of Dr. Korotkov is very suspect.Dr. José de Jesús Zalce Benítez – Doing a quick Google search on Dr. José de Jesús Zalce Benítez, you discover he is the same one credited as being a part of the “Roswell Slides” research team who worked with Jaime Maussan. His testimony was that the slide depicted an alien, and since that whole story turned out to be a hoax, it does question the validity of this expert as part of this team and makes any conclusions he may draw very suspect. Interested in the story? Be prepared to pay. I will not discount any story because there is a “pay wall” to access it — but you do have to question motive if there is one. Using the Roswell Slides story as an example, to see the discovery and the “reveal” you needed to sign up, and pay to watch the event in Mexico. It is unknown how many paid to do just that when the event was broadcast, but it is believed to be well into the tens of thousands.The dissemination of information about Unearthing Nazca, and the mummy in question, is behind a pay-wall to access as well. Meaning, you need to signup as a paying member to GAIA.com to see the story unfold. But the difference here is it appears to be a running “series” so the information will be spoon-fed to the public. This approach is admirable as they will reveal the information as it comes in, but it does prolong the necessity to keep your paid subscription longer. The latter part of this point makes this suspect. Again, this point alone is not a sign of a definite hoax, and I believe they have every right to charge what they wish for access to their site and material. However, a discovery like this should be written about and chronicled within scientific journals, and IF the discovery is that big, it should be released to the public for the betterment of humanity and our understanding of our place in the history books. But, that is just my way of thinking about such a revelation. There are known, crafted, and artificial mummies being circulated in Peru and South America. On June 24, 2017, Nahuel Monteblanco of Cientificos.pe published the following article, as translated into English. I was forced to use an online translator, so please forgive any errors during that process. But I believe the information it displays is possible proof that this is a manufactured mummy that is not a true artifact from history, but rather, a mish-mash compilation of bones and tissue made to look real (and even alien) – but is not. This week again the archaeological theme comes to the fore, revealing how far we are from being a country that appreciates the history of the territory it occupies. We have an immense historical legacy, with cultures ranging from Caral to the Inca Empire, a great source of history and knowledge, and well cared for, could also become an immense source of tourism and income. In spite of this potential, we do not have a real system of protection of archaeological remains that works and with the amount of professionals who are in charge of the valorization of these, that study and validate every piece that is discovered. 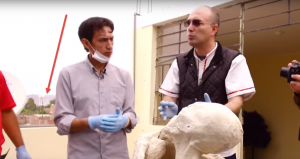 Today we have to bring to light the case of supposed extraterrestrial mummies , that is, bodies of non-human beings found in the Nasca desert, and that have been promoted internationally by people like the Mexican ufologist Jaime Maussan and his team of Collaborators, all of them researchers of paranormal phenomena and extraterrestrial life, none outside that circle . We contacted the Ph.D. Rodolfo Salas-Gismondi , in charge of the Department of Vertebrate Paleontology of the Natural History Museum of the UNMSM and associate researcher of the paleontology division of the American Museum of Natural History in New York, whom we ask to inform us more about. Here is the interview with the Ph.D. Salas-Gismondi, who analyzed this case and presents its chronology and conclusions. “First appears a man named Ronceros, who presented the remains through home videos on YouTube saying that they were true aliens. Basically, it presents the remains that are observed in the photos that made us arrive and are observed in the following video . 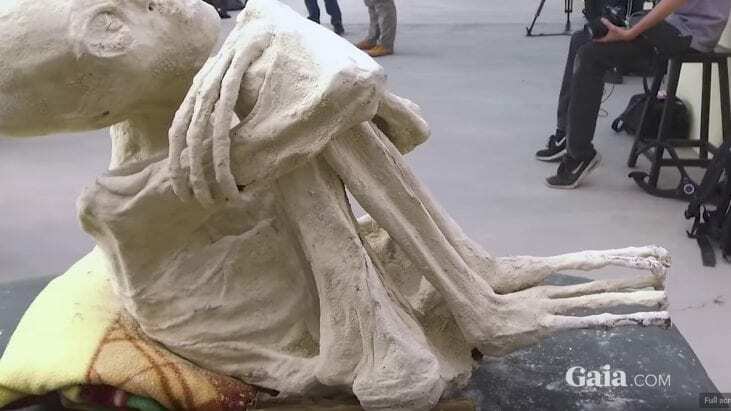 After visiting the Museum – and certain other institutions – and seeing that no one would believe that story, Ronceros changes the script and says that they are representations of aliens (not true aliens) made by pre-Hispanic cultures using bones of animals and people. In this interview Ronceros enters into contradictions and can not support the veracity of the findings, even trying to undermine the Ministry of Culture ( video ). The mummy of Maussan is different from the one that Ronceros shows, it is a new mummy. My friend, the archaeologist Pedro Vargas Nalvarte, has seen directly the remains that took Ronceros to the Museum and clearly determined that they were false. The newspaper El Trome has published an investigation , related to the specialists who support the alien identity of the mummy. At this moment appears Jaime Maussan – journalist, ufólogo, hunter of ghosts -, who affirms that the mummies do correspond to true aliens. The so-called Ronceros alien mummies are made of bone remains of humans and animals, in most cases mixed. The result is beings of humanoid appearance without any natural anatomical organization because the bones do not correspond between them. The human remains used are apparently archaeological. The Maussan alien mummy is an archaeological mummy with the typical fetal position and known cranial deformation in pre-Hispanic cultures. From the x-rays that can be seen in the video , the whole skeleton of this mummy is made up of human bones. Even the feet and hands, which have only three long fingers, are formed of human metaphors and phalanges. 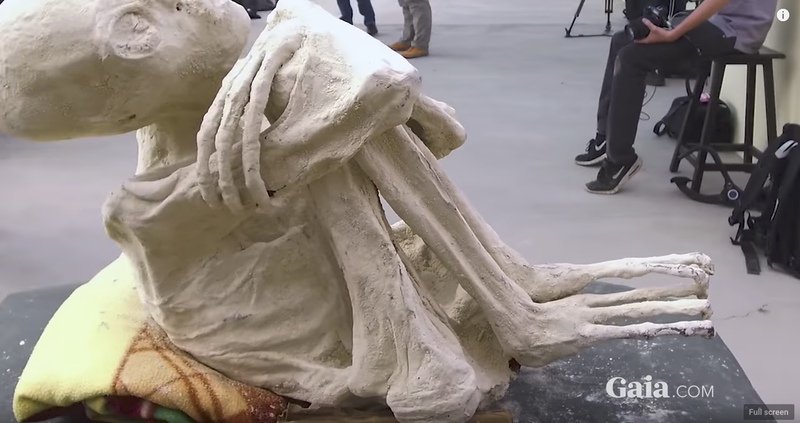 The fact that this mummy has only three fingers and that the bones that make up these fingers are exactly the same as those of a human who has five fingers, has no evolutionary sense. If this creature had evolved three fingers, there would be other anatomical changes in the bones of the arms, hands, legs and feet, all these changes associated with the evolution of three fingers. None of this happens in the skeleton. In contrast, they lack the cuboid tarsal bone and apparently the external fingers. This mummy is an archaeological mummy to which two fingers have been removed and the number of phalanges increased to the remaining three fingers. On June 30, 2017, Gaia released this update video on their investigation. It is included here for reference. I have reached out to Gaia, and offered to post ANY / ALL rebuttals to the above points unedited. Although this video addresses a date discrepancy on one of the images used in their video (good catch – but never thought that was an issue, and was never listed above), there are still many unanswered questions. As of the writing of this message, I have not received any request to post any rebuttals or comments. As of July 10, 2017, Gaia has continued to run (non-public) update videos chronicling this story. I am unable to post these, since they are behind a pay-wall, but they are worth a mention as Gaia has released more information on their journey. I just can’t publish them here. On July 10, 2017, I added the below interview (via email) that I conducted with Melissa Tittl, Director of Content Creation, from Gaia. Let me first say a special thank you to Melissa, and Gaia, for allowing me to ask such skeptical questions. 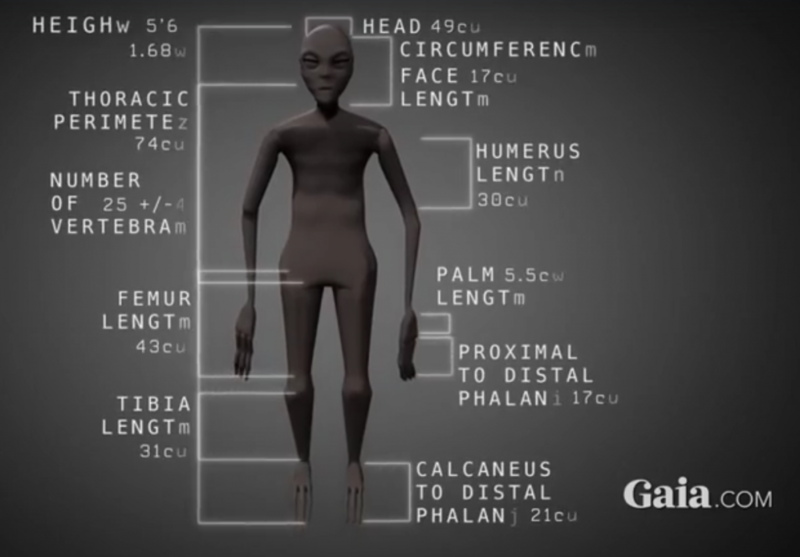 Please note, as I said to Gaia, I felt the overall details of the case and specimen were out there, and I did not want to just repeat what they had already answered, or what could be deduced from the videos. I have a lot of respect to those (and this is directed to Gaia) for those who are not afraid of skeptical questions. So, my special thanks to Melissa for taking the time to address my larger concerns. Thank you for agreeing to speak with me about this. As I mentioned to you privately, and also printed publicly, I am a friend of Gaia, and my skepticism here is simply due to my skepticism on claims like this. I mean no offense by posing some of these questions, but rather, feel some of this is of key concern to many out there, and I appreciate you taking the time to address some of the concerns. I feel that is a strong indicator that Gaia is not afraid of the truth, and will meet skepticism head on. I appreciate that! I tried to be fair, balanced, and bring up valid points of concerns, which lead to my line of questioning below. For the record, Gaia has already done many interviews about this, most notably with EarthFiles, and I believe much of the substance of the find is found in those interviews. I do not want to waste your time and ask a bunch of repeat questions, so I am going to focus on the larger and more skeptical points which I feel have not been asked or addressed. 1) One of the biggest concerns generated by the video, is the lack of scientific method when handling the mummy. I do not believe this is on the side of Gaia, as I was told the location of filming was dictated to you, rather than chosen, but were you concerned at all about how this specimen was being handled and the location it was handled in? If this truly is a genuine find (like a new missing link in our evolution, or new species, or new whatever) wouldn’t it be in a controlled, laboratory type setting rather than outside in that climate and handled the way it was? Is this a concern? Melissa: You have to understand that we got word of this discovery and we thought ” lets check it out”. We didn’t actually know what we were going to see. They told us to meet at that location and we did and that is where they brought out the big body. When they pulled it out did look strange. I think all of us were kind of taken back that it looked sort of fake but then other parts of it had real human like components. We just wanted to keep documenting the discovery. I think it should be in a controlled laboratory. Again, we didn’t know what we were going to see so on the advice of some of the people in the medical field there at the time we took samples. We as Gaia were documenting this. I have called many different organizations to be involved going forward so that we can hand this off to science. It has not happened yet but many people involved are trying to make that happen. The bodies are registered with the ministry of culture in Peru. They will be giving their thoughts on the matter I am sure soon. We are just documenting something that could be real, could be a hoax or could be something completely different. Our job is to find out what it is and we really really want that to be backed up by science. This might be a network where we have alot of different programming but this is something that is a bit different and we don’t want to speculate what it might be but rather have science depict what it might be. We are here to give you the story. 2) On the above note, although the specimen may be determined old by Carbon 14 dating, how can we trust any other potential discoveries or anomalies, as they may just be a result of contamination? Melissa: I can’t answer if they could or could not be contaminated. The team that we documented while we were there was doing the best they could. It’s interesting to note that there are several different samples sent out to labs for carbon dating results and they are coming up with the same date for the big body. I think that is interesting. Melissa: His name is Paul … from what I understand. These items presented here are not what we took samples from and it is not what we were looking at when we were down there. Even those small bodies look different then the ones that we looked at. However, it is a strange connection. Could they be all be related in this way? We have to find out. I guess being a journalist i would say the strangest conclusion Paul came up with was ” they are fabricated but a long time ago” Why? Again our job is to get to the bottom of all these questions. I know there is a lot of them and we hope to answer them as we get results in and hopefully hand over to science. WE are basically saying we are looking in to it and we will publish the results as we get them. Melissa: Yes I agree there are other ways to hold together body parts. We are looking into this as well. I have several phone calls into experts that could possibly explain how this could be done. This of course is something that hasn’t aired yet but the team at Gaia is looking into not only how it could be real but how it could be fake. Again, I can’t stress enough our job is to document what we see and not to make conclusions based on assumptions. No one in our company has said it is real. 5) Many criticize the main person involved in this, Jaime Maussan. I have known Jaime for many years, and like him as a person, but there is no getting away from the fact that many of his discoveries have been proven fakes. I listed a few on my article, but most notably and recently, the “Roswell Slides” which was, of all things, a mummy. He was highly criticized for publicizing this as an alien, and made people pay to see the full reveal. It is now considered it was all a fake, and Jaime has apologized on at least one occasion that I have heard. With this growing list of hoaxes, what is Gaia’s response to that? Is this a concern at all that this list of hoaxes include an alien mummy, alien creature, a fairy and an alien photo? Melissa: Jaime is going to do Jaime. We happened to hear about this just like he did and we thought it was interesting. There are alot of interesting characters in this mix. Its not what people say or what they do its why they do them in the first place. That is the work of a journalist. Hopefully , we at Gaia get to the bottom of the scientific results. 6) As indicated in question 5, the Roswell Slides were largely touted as “alien.” Among those giving that conclusion was Dr. José de Jesús Zalce Benítez. So, his inclusion in your video makes his conclusions highly questionable given his involvement with that. Why should we consider his opinion now as valid? Melissa: I cannot speak about the Roswell slides because I was not involved. I do know the criticism that team got from the out come and it would seem that same team is at it again. However, I find what he has to say interesting because some of the structural talk on the bones correlated with what the American radiologist said. They are talking points based on observation but once again Gaia is documenting this meaning we will take all sides of the story and conversation. What I would really love is for anthropologists and archaeologists to get involved. I would also like a university to give their opinion with a full forensic diagnostic. I invite that opportunity so our journalistic view of this can go even further. Pieces like “Unearthing Nazca” are not supposed to make people upset but ask these questions: Who do we trust? If someone would fabricate this why would they do it? Why do people keep searching for evidence of ET’s?” These are all valid. Keep asking. Lets keep digging. The only way we can get to the bottom of stories like this is not to dismiss them but ask why they exist at all. I hope our team can uncover all angles. 7) The white plaster-like appearance to the mummy is unlike any mummy that I have been able to see in museums or online digital archives. Is this a concern for Gaia that although the “insides” date back 1800 years approximately, the sheer appearance of the mummy is unlike any others? For the record, Luis Quispe that I mentioned above, said the white material was simply clay. Melissa: We got the white powder test results in just yesterday and they are not JUST CLAY. I can’t tell you what they are yet but this is very interesting. Something we hope to get a Paleo-biologist and other forensic specialists on board to look at. I also raise other questions/points in the article, which I welcome your response to. However, the questions above are my “top 7” that I feel are the most critical to address. On behalf of those who have an interest in this story, and want to give it a chance (like me! ), THANK YOU for your time, patience and understanding for why the above questions are asked. As promised, I will published any and all responses you’d like to the above (and whatever else), UNEDITED, to my article for my viewers. Do the above answers satisfy your skepticism? Offer your input below. For the record, however, I do not believe Gaia is the one orchestrating this hoax, but rather, they are documenting the evidence that is put forth to them. I believe the the root of the hoax, if there is one, stretches back farther time-wise than their involvement. Want to add your two cents? Add your comments below!